This week we’re joined by our friends at The Village Vets: Dr. Will Draper and Dr. Stacy Stacy. Dr. Will Draper founded the Village Vets and is widely recognized for his contributions to veterinary medicine. Earlier this year, he won the national “Veterinarian of the Year,” as awarded by Purina. 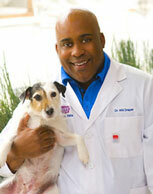 Dr. Stacy Stacy has been honored as one of Atlanta’s “Best Vets” and a Five Star Veterinarian in Atlanta Magazine. Dr. Stacy’s veterinary interests include internal medicine, cruciate repair and infectious diseases.